Hill County Courthouse Texas history, photos, travel, hotels. In 1852 doctor Josephus Murray Steiner and Elijah Sterling Clack Robinson devised a plan to stimulate land speculation by creating a new county. This new county would be created by subdividing Navarro County. As a result of some help from Governor Bell, a special session of the Texas Legislature was called and a bill to divide Navarro County was signed into law on February 7, 1853. Hill County was named for Dr. George Washington Hill who had served as Secretary of War for President Sam Houston, and also had been elected to the state legislature from Navarro County in 1851. 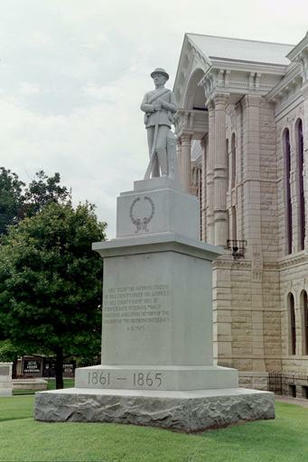 During a special session of the Hill County Commissioners Court on August 23, 1853 a parcel of land near the center of the county was donated to form the county seat. The county seat was originally called Hillsborough but the town's name was changed to Hillsboro in 1854 when the Post Office declared names ending in �borough� should be changed to �boro�. In 1881 the railroads arrived in Hillsboro and along with them came jobs and prosperity. As a result of the railroads, county population grew after 1881 and well into the early decades of the Twentieth Century. Because of the available rail transportation and jobs, German and other European immigrants came to the county to settle. Cotton also contributed to the prosperity of Hill County, but after the 1930's Cotton production declined probably because of the Depression, and the advent of synthetic fabrics. As a result of the exit of the railroads from the area in the 1930's followed by the demise of agriculture and then manufacturing, population declined in the county until the 1970's. Today agriculture, manufacturing, and retail operations all contribute to the prosperity of Hill County. Hillsboro's location at the convergence/split of Interstate Highway 35 East and West provides plenty of traffic for the the Prime Outlet Mall and many other local retail establishments. 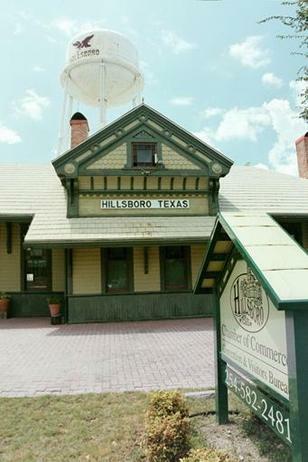 In 1981 Hillsboro was one of the first Texas towns selected by The Texas Historical Commission for the Main Street Program. Hillsboro's special status as a Main Street Community makes it eligible for grant money and other planning and assessment services through the THC. The Texas Main Street Program's purpose is to encourage economic development through historic preservation and renovation of buildings and property. The Hillsboro Main Street Program's mission is to create, restore, and inspire the quality growth of downtown Hillsboro. 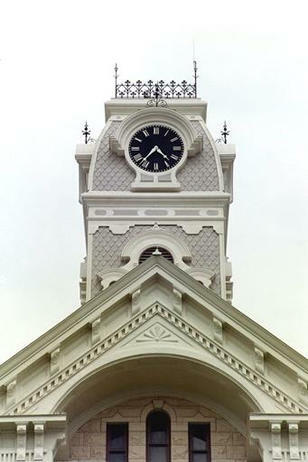 The Hill County Courthouse is a three-story limestone structure of Second Empire style, but it also incorporates Classical Revival and Italianate influences. Two story high Corinthian columns, mansard roof treatment, and a wood framed three-tier 70 foot high clock tower covered with ornate tin work are the most conspicuous details of this regionally influenced architectural marvel. This building is the third and arguably the grandest of three similar courthouses designed by Waco architect W. C. Dodson in the last half of the 1880's. Nearby Hood and Parker counties also have W.C Dodson courthouses of the same vintage. 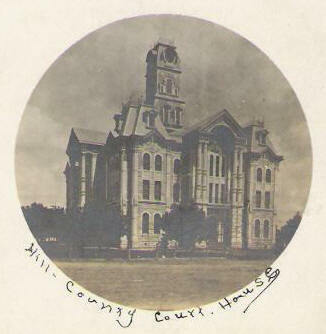 The Hood County Courthouse was actually constructed at about the same time as the Hill County Courthouse, and both buildings were completed in 1890. 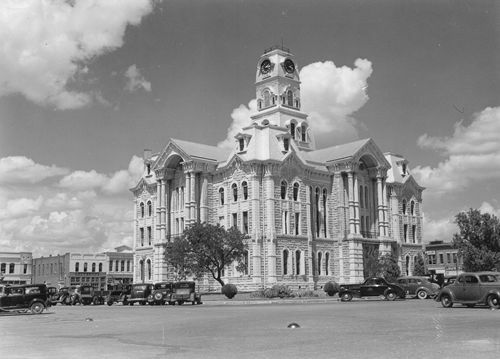 The Hood County Courthouse was, by design, a lesser structure and originally didn't even have a clock tower included in its plan. The Parker County Courthouse was built several years earlier and although it's a grand building, it lacks some of the ornate details present in the Hill County Courthouse. The first floor of the courthouse is roughly divided into quarters by intersecting halls. The second floor contains office space and the District Courtroom. The two story high ceiling of this courtroom extends up to the third floor balcony where additional seating is provides. The courthouse also has a basement. Evident from below the first floor is corrugated iron arches laid on the bottom flanges of iron beams. Concrete was poured onto this iron structure to form floors. This construction method was relatively new in 1889 and you won't find it in buildings built much before this time. The Hill County Courthouse was destroyed by fire on the night of January 1, 1993. The destruction was nearly complete. All that remained standing was the four limestone walls. The courthouse was a wooden frame structure and the clock tower and wooden truss supported interior collapsed onto the basement. The massive iron staircases survived, but I don't think much of anything else could be salvaged. 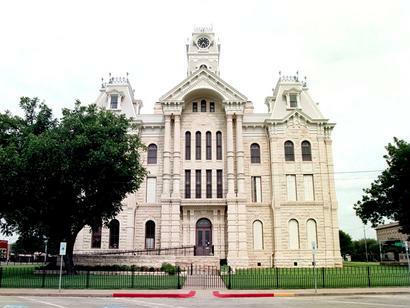 It's a testament to the determination of the residents and elected officials of Hill County that they were able to rebuild their beloved courthouse during the rest of the decade of the 1990's. Today, the Hill County Courthouse is again perfect in nearly every detail. 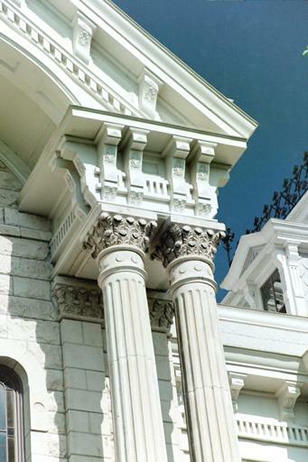 Two story high Corinthian columns on the Hill County Courthouse. 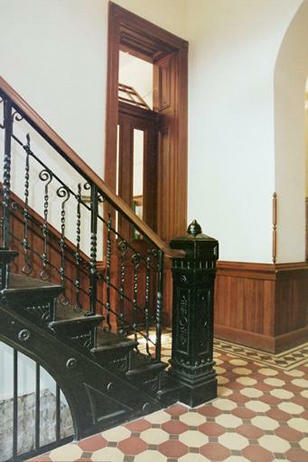 Iron staircase and door on first floor of Hill County Courthouse. 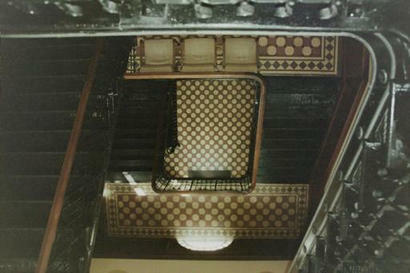 Stairwell in Hill County Courthouse. 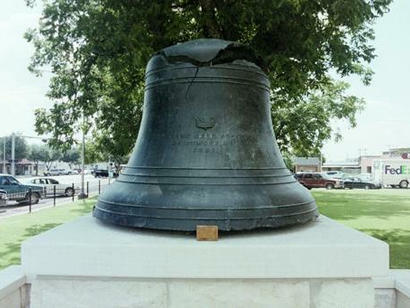 Original Hill County Courthouse bell showing damage from fire. Because Hillsboro had a period of growth in the late 1800's and the early 1900's followed by an extended period of economic decline, many vintage buildings remain in an unmodified state around the town square. Today many of these buildings are occupied by merchants that provide products and services valuable to tourists and Hillsboro residents. Tourism is wonderful, but there's just something refreshing about a town square with a mix of merchants that appeal to the locals and tourists. The Old Rock Saloon was the first building to be restored under the Texas Main Street Program. Judging from the cornerstone date of 1876 the building is probably the oldest surviving commercial structure in Hillsboro. This saloon was at one time owned by J. E. Ballard, Mayor of Hillsboro from 1889 to 1893. Originally there was a cockfighting pit at the rear of the building and a gambling hall upstairs. Today the Old Rock Saloon at 58 W. Elm St. houses law offices. This building is interesting for its age alone. The cornerstone with 1876 date can be seen clearly from the entrance to Bond's Alley. Some stone mason chiseled the left side of the cornerstone off during a renovation but the date is still legible. The Old Rock Saloon and Bond's Drug Store set on opposite sides of the entrance to Bond's Alley, on the south side of the courthouse square. This alley has been a popular spot for public gathering over the years. 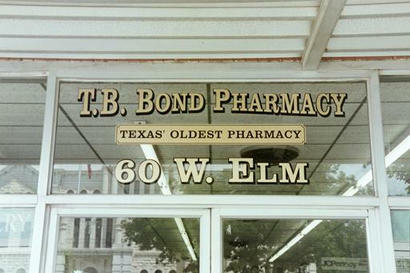 Bond's Alley is names for Bond's Drug Store which has been in business at this location since 1881. One can only imagine all the forms of camaraderie, larceny, and politics that have occurred in this alley over the years. The Cell Block Museum: Old county jail house located one block north of the Courthouse. Open Saturdays April through November. Katy Depot: Built to serve the Missouri-Kansas-Texas (Katy) Rail Line. Today, home of the Hillsboro Area Chamber of Commerce. A great place to gather information for your visit! 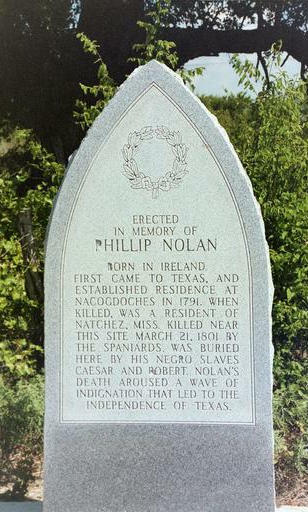 Phillip Nolan Marker along Hwy 174. Probably the first Anglo to visit what eventually became Hill County. Killed by Spanish March 21, 1801. Texas Historical Commission, Texas Historic Sites Atlas. �Hill County.� The Handbook of Texas Online. � Sam Fenstermacher All rights reserved.